SOFA: A charming, tiny-flowered, cotton fabric covers this two-seater sofa, of hand-made American manufacture – and it comes complete with a hand-made cushion. BOOKSHELVES AND SIDE TABLE: Antique pieces from the early 20th c., with pale green accents on the drawer and shelf backs. Please note that the legs on the sideboard make this piece slightly fragile. On the side table, stand a vintage brass teapot and coffee pot, ready for tea to be served. 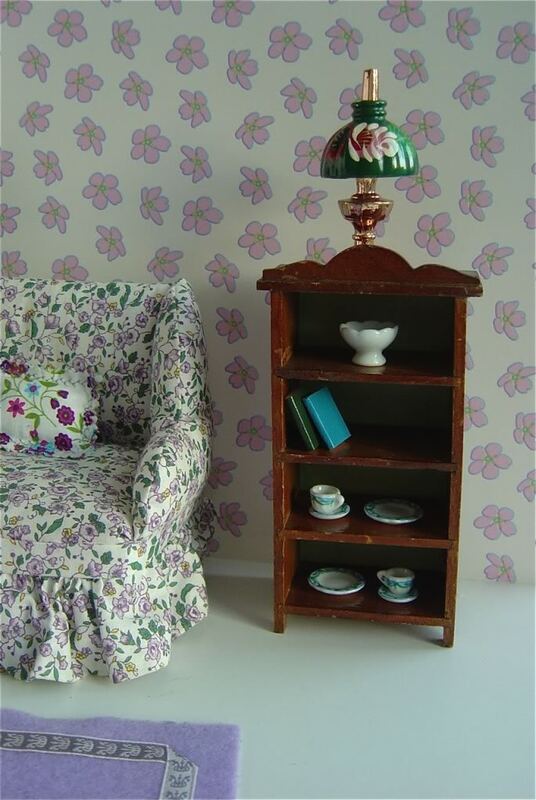 The bookcase holds two teacups plus a lovely hand-painted, bargeware lamp. MIRROR: Another antique piece from the early 20th c, which goes beautifully with the side table. Please note that the glass in the mirror is fragile! 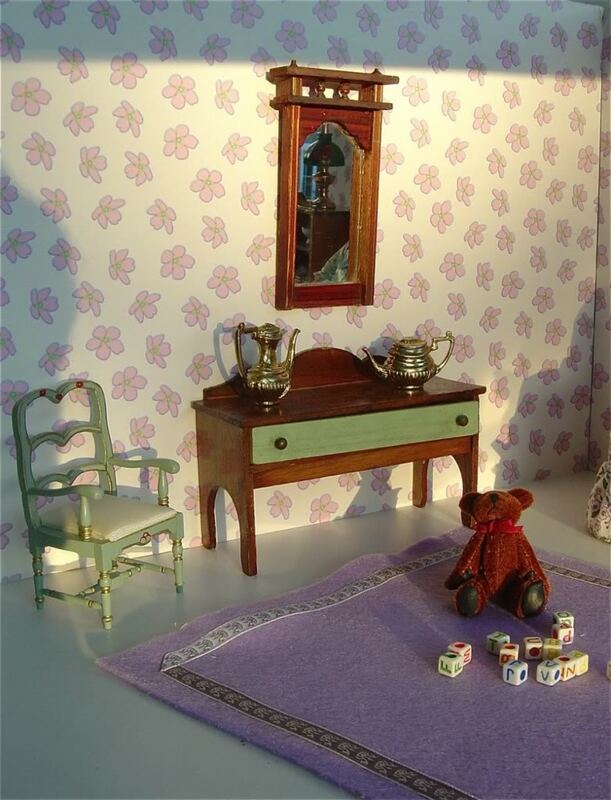 GREEN CHAIR: Beautifully-made, modern, side chair for teddy to sit on. (A teddy comes with this set). Please see the close-up photo of this chair to see its lovely gilded detail. RUG: Hand-made, lilac felt rug trimmed with gorgeous woven ribbon. WALLS: Covered in vintage wrapping paper, which has been mounted on two A3 pieces of 5mm thick foam board. Each piece of foam board measures 42 x 29.5cm or 11 5/8 x 16 3/8in. 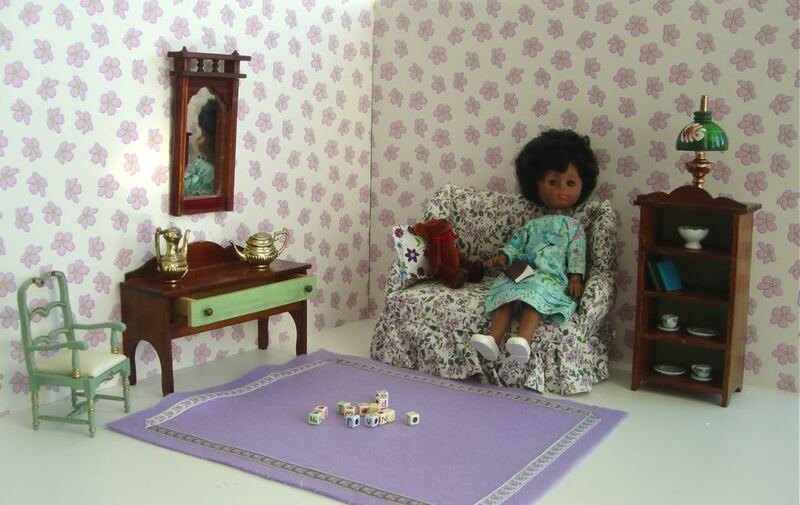 Dolls: Available from our selection of vintage dolls. 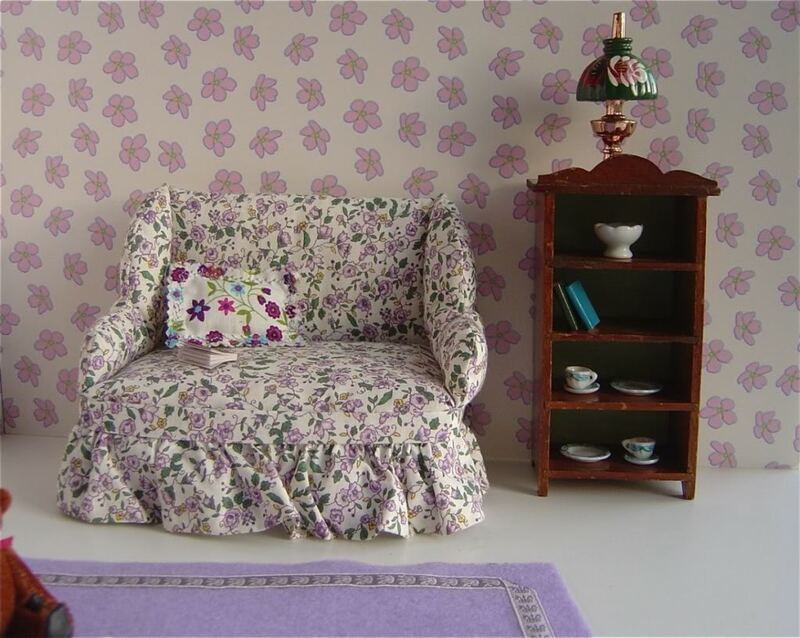 Shown here, a vintage ‘Ginette’ in a flowery dress. Price: £35.00 with clothes and shoes shown. Additional clothing for this doll is available – please see the relevant section of our website.